Ardbeg 15 Year Old 2000 vintage Islay single malt Scotch whiskey. 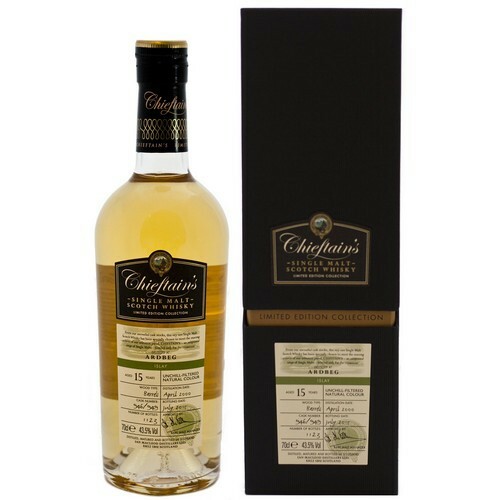 Matured in bourbon barrels #946 & #959 bottled July 2015 Ian MacLeod for the Chieftain's range. 1,123 bottles. Ardbeg Distillery was established in Ardbeg on the Kildalton Peninsular on the Isle of Islay in 1815 by John McDougal. Ardbeg Distillery draws soft peaty water from Loch Uigeadail and Loch Airigh nam Beist up amongst the hills behind the distillery.